Figure 50.5 Zoomed extract (for northern Lake District-Solway Firth) of the information held in the BRITICE GIS and on the Glacial Map. Drumlins are recorded as short straight black lines; meltwater channels, eskers and small moraines are recorded as curving black lines. Erratic source areas, pathways and limits are also shown. Large black features are moraines. For a colour version of this figure, and indeed map of the whole of Britain, please consult Chris Clark's website at the University of Sheffield. Printed versions of the Glacial Map can also be purchased from the website. Ordnance Survey grid-squares are 10 km. ice-sheet retreat pattern. Approximately 8000 meltwater channels have been identified and mapped in the published literature and BGS maps and reports, but have never been utilized previously to build an ice-sheet-wide synthesis of retreat. It is crucial to distinguish between subglacial, ice-marginal and proglacial meltwater channels in order to derive appropriate palaeoglaciological information. Well-defined subglacial channels (i.e. with humped long-profiles) inform us of a warm-based glacial thermal regime and disposition of the hydraulic head, which in turn can be used to assess former ice-surface slope and hence ice-flow direction. Ice-marginal or lateral meltwater channels are formed in positions where the glacier edge meets a slope and are of great value for ice-sheet reconstruction, because they record former ice-marginal positions during recession (e.g. Dyke, 1993; Kleman, 1994; Hattestrand & Clark, this volume, Chapter 39). Proglacial channels are more difficult to differentiate from non-glacial, fluvial channels. Diagnostic features are channel sizes much larger than the modern fluvial catchment could reasonably produce or incongruous locations, for example, on upland cols. 3 utilized the above to produce a preliminary reconstruction of ice-retreat pattern. to contours; channel form (straight or sinuous); and interchannel relationships (isolated or within a sequence/system). Preliminary classifications made on this basis were supported, where required, using GIS analytical tools. Gradients were calculated where the channel appeared neither gentle nor a chute and where further precision was required to aid identification. Subglacial and lateral channels of 6-28° and 2% gradient are described by Sugden et al. (1991) and Sissons (1961) respectively. Longitudinal profiles were taken along channels to establish if undulations occurred (i.e. indicative of subglacial formation). As digitizing errors are inherent in the GIS database, each long profile was taken three times and mean values calculated. The number of undulations was recorded and their gradient calculated, in order to express the degree to which the channel flows up and downhill. Observations were recorded for all channels in the BRITICE GIS. Each channel type was subdivided into three categories of certainty according to our subjective level of confidence as: 'definite', 'probable' and 'possible'. The process of channel classification is demonstrated in Fig. 50.6 and Table 50.2, for an area on the western flanks of the southern Pennines, east of the Cheshire-Shropshire plain. Data generated by the categorization procedure for these channels is presented in Table 50.2. Results from the above analysis are presented in Fig. 50.7. Most channels fall into the lateral (including submarginal) or subglacial categories. It is unfeasible that the mapping reported here represents the true population of meltwater channels, and it is clear that much further investigation is required. Indeed when performing the above analysis we sometimes found obvious, but hitherto unreported channels (Fig. 50.8). These were not entered into the database, but could form part of a future project. Although the identification and mapping of channels is incomplete for Britain, there is sufficient density and coverage to formulate reconstructions for parts of the ice sheet. The logic behind this is simple: lateral channels record successive margin positions as the ice sheet retreated and subglacial channels must be orientated parallel to the direction of the steepest ice-sheet-surface profile, and hence can be used to approximate ice-flow direction. As the channels clearly require meltwater production we infer that they must have been created in the ablation zone of the glacier and presume that they therefore record the configuration of ice close to the termini and during retreat. In building the retreat pattern only our certainty classes of 'definite' and 'probable' were utilized. Figure 50.9 illustrates how retreat patterns are generated from such data. This process was performed for all areas to produce our overall assessment of ice-marginal retreat (Fig. 50.10). We do not comment in detail here on the patterns and possible timing of retreat. This can be attempted only at a later stage when other data layers are considered and are integrated with timing constraints provided by geochronometric dates. However, a number of general points are self-evident. 1 By combining the wealth of published literature on melt-water channels it is possible to reconstruct large fragments of ice-sheet retreat. *F, valley floor; S, valley side; C, col; Fp, flat plateau. tPp, perpendicular; O, oblique; PI, parallel. tS, straight; Ls, low sinuosity; M, meanders. §Ind, individual; Sr, series; N, network; Sys, bifurcating and anastomosing system. fG, gentle; S, steep chute. Original literature suggests humped profile, confirming subglacial identification, though DEM resolution is too coarse to identity humped bed. Digitizing is slightly dis-aligned from channels evident on DEM: observations taken assuming digitized channels fit DEM. Figure 50.6 Illustration of grouping of meltwater channels into lateral and subglacial categories. In the northeast is a sequence of lateral channels positioned on the slope sides. Running parallel or subparallel to contours, these channels have a gentle gradient, straight form and smooth longitudinal profile. The main network is mostly subglacial channels, flowing across valley sides and floors predominantly oblique to the slope gradient. Many have a sinuous form and develop a complex bifurcating and anastomosing system. Three channels demonstrate an undulating longitudinal profile, lending strong support to a subglacial classification. The area is on the western flanks of the southern Pennines, east of the Cheshire-Shropshire Plain. require an explanation that includes retreat, subsequent read-vance and further retreat in a different direction. The possibility remains that some of the meltwater channels are preserved from an earlier glacial stage. The ice sheet did not retreat as a single entity, but rather as it thinned and retreated it separated into component ice caps, which then accomplished their own retreat, such as over the mountains of North Wales and the Southern Uplands of Scotland. Ice retreat was not always to higher terrain. For Scotland this appears to be the case, but in the Pennines for example, ice retreated westwards through the trunk valleys and beyond the main north-south topographic axis. Meltwater channels on the western flank of the southern Pennines and Peak District, along with moraines and channels in the Cheshire-Shropshire Basin, indicate retreat towards lower ground and the Irish Sea Basin. Taken together these observations indicate that substantial ice volumes must have existed to the west of the main north-south topographic drainage divide and off the west coast of England, in the Irish Sea. This might have been a result of either significant ice build-up there, perhaps in the confluence between the British and Irish Ice Sheet, or from a late-stage readvance. Given the above-mentioned retreat patterns it is evident that the growth and decay of the British Ice Sheet was asymmetric. According to accepted glaciological principles, growth likely initiated on the higher ground and spread out from here, but the data for England indicates retreat well to the west of the high ground. Future challenges lie in the compilation of a more complete reconstruction than that outlined above. However, our case study demonstrates the value of an ice-sheet-wide and inversion approach to reconstruction, and highlights the wealth of underutilized geomorphological evidence that exists in the literature. likely turned on and off like their modern counterparts. This makes the task of constraining ice sheets in time and space much more difficult and requires many more geochronometric dates. Figure 50.8 Solar-shaded digital elevation model (DEM) of the terrain containing the Flemington eskers and associated kame and kettle topography to the south of the Moray Firth in Scotland. 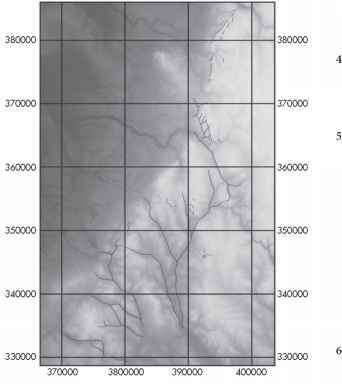 Esker ridges (E) and meltwater channels (M), as depicted by Merritt et al. 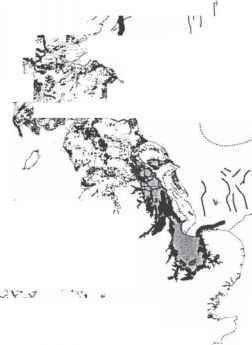 (1995) and on the Glacial Map of Britain (Clark et al., 2004), are highlighted. Note the large lateral meltwater channels slightly northeast of the image centre. 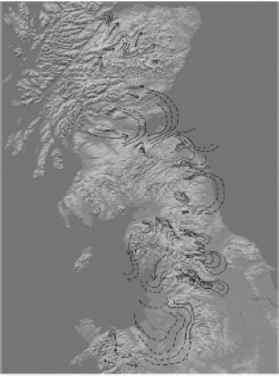 These are outside the area mapped by previous researchers and therefore not included on the Glacial Map of Britain. Similarly, the fluted terrain visible in the northwest sector of the image and documenting the flow direction of the former Moray Firth Ice Stream has never been mapped. Image is 45 km across and is derived from a 50-m grid-sized DEM. events it should be possible to use absolute dating to constrain the timing, but for changes internal to the ice sheet we have to rely on correlations further afield and some relative-age dating methods. Superimposition of landforms for example clearly reveals the relative age of each event and thus can be used to build sequences of ice-sheet changes but that remain unfixed in absolute time. For the BIIS, dating constraints in the past have been inadequate in both number and quality, and much of the literature was used in making and arguing about tentative correlations between places. Bowen et al. (2002) for example comments on the dearth of radiocarbon dates and that the timing of the LGM ice sheet was adduced from only five dates from four localities. Recent developments in dating are beginning to rectify this, in particular by cosmogenic and amino acid methods (Bowen et al., 2002), although problems in the British aminostratigraphy have been identified (McCarroll, 2002). However, when compared with the number of dates that are required to constrain the dynamics or compared with the amount of dates related to other ice sheets (e.g. Laurentide Ice Sheet has some 4000 dates constraining its deglaciation; Dyke et al., 2003), it is clear that dating control is largely inadequate. Major advances in understanding of the BIIS and elucidating its links with climate are likely to accrue from systematic dating programmes. Until such time that more data are collected, we consider it useful for someone with a good knowledge of dating methods and their uncertainties to produce a database of all British-Irish dates. How many are there, what is the spread in time and space, where are the gaps, which ones are reliable? This could include a map of locations, comments regarding their stratigraphical context, age estimates and error bars and some assessment of which are considered reliable. Dyke et al. (2003) have produced this for the Laurentide Ice Sheet and it will prove invaluable for those reconstructing ice dynamics of this ice sheet and correlating events further afield. A preliminary version of an assessment of chronological constraints for the British Ice Sheet is available in Evans et al. (2005). Fieldwork aimed at identifying and mapping landforms and deposits is likely to continue to be a valuable means by which we can derive new information pertaining to the dynamics of the ice sheet. However, recent developments in remote sensing and DEMs, and increased availability of these data, are set to revolutionize our approaches to mapping, and permit mapping over much larger areas, allowing the recognition of large-scale patterns that might be invisible at the fieldwork scale. Satellite images typically cover areas of 100 x 100 km and greater, permitting a single researcher to conduct widespread mapping of glacial geomorphology in a systematic manner and avoiding the persistence of a fragmentary map record. The spatial resolution (related to pixel size) varies between 2.5 and 80 m. The combination of area of coverage and spatial resolution determines the range of appropriate mapping scales. With aerial photographs it is usual to map at scales around 1 : 20,000 but it is hard to work at smaller scales (e.g. 1: 100,000) without recourse to specially prepared mosaics of photographs, which are often not available. Because most satellite imagery is digital it is easy to work at a wide range of scales, up to the limit imposed by the spatial resolution, such as 1: 45,000 for Landsat TM. Being able to work across a wide range of scales (e.g. 1: 45,000 to 1: 1,000,000) frequently leads to the observation of landforms or patterns that would otherwise have gone undetected. Hitherto unknown landforms or patterns often can be distinguished that are only faintly discernible or even invisible when viewed from ground level or on aerial photography. The utility of satellite images should not be used to justify the abandonment of aerial photograph analysis. In addition to the fact that aerial photographs provide a higher level of detail, the increased digital analysis of images makes it likely that they will soon be available as orthorectified digital mosaics. This will simplify their use in geomorphological mapping and permit syner-gistic use with satellite imagery. 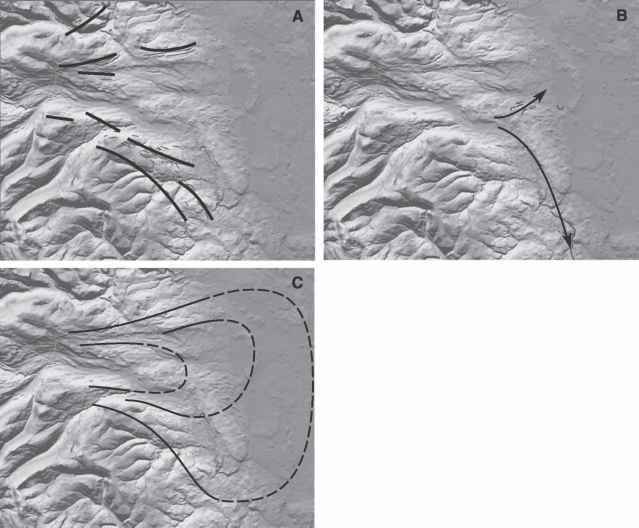 Figure 50.9 Illustration of how meltwater channels, in conjunction with their relation to topography, are used to derive patterns of retreat: (A) lateral channels provide information on successive margin positions; (B) subglacial channels indicate the flow direction; (C) combined, these features permit a reconstruction of retreat. The dashed lines indicate inferred margin positions based on topography. This area is of the eastern end (outlet) of Wensleydale in Yorkshire. readily recognized and mapped from such data. In the immediate future higher resolution sources of DEM data are likely to become available (from Lidar and airborne radar interferometry), and with grid resolutions of the order of 5 m and less it is expected that an even wider range of landforms will be visible and thus permit complete country-wide mapping of glacial landforms. Data sources and methods for satellite image and DEM analysis are reviewed in Clark (1997). requires extending to include Ireland, for which there is a wealth of published data. 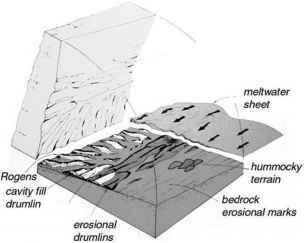 For both Britain and Ireland data the layers could be extended to include geochronometric constraints, striae, hummocky moraines and stratigraphical information. 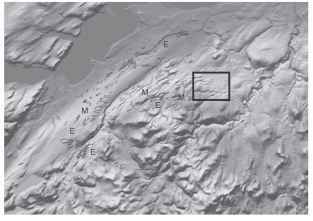 Figure 50.11 Perspective view (looking north) of the topography of the Vale of York. 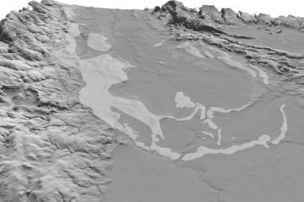 Overlaid (in light grey) on the digital elevation model (DEM) are the York and Escrick moraines and the Linton-Stutton gravels, as mapped by various researchers and depicted on the Glacial Map of Britain (Clark et al., 2004). Note that the DEM picks out sections of the moraine ridges not mapped previously. Image is ca. 60 km across in the foreground and is derived from a 50-m grid-sized DEM. need to address the possibility of catastrophic break-up of parts of the 'marine sectors' of the ice sheet and consequent streaming behaviour and reorganization of flow patterns and divides. Identification and the dating of any such events will help inform the growing body of research on the impacts of meltwater discharge on ocean circulation. Compared with other glaciated regions, very little research has been undertaken on the identification of ice-stream imprints in the British glacial record. Based upon the evidence compiled on the Glacial Map of Britain we suggest that the most compelling evidence available so far for palaeo-ice streams occurs in the Vale of York, Vale of Eden, Wensleydale and the Tweed Valley, where subglacial lineations document the impact of former trunk flow. Elsewhere, such as the Irish Sea basin and Moray Firth, ice-stream activity has been proposed based upon topographic constraints and sedimentological evidence (e.g. Merritt et al., 1995; Evans & O Cofaigh, 2003). On the continental shelf to the west of Scotland two huge debris fans exist (the Barra and Sula Sgeir Fans; Stoker et al., 1993) and these are known to have been fed by debris during the Devensian. We see it as likely that major ice streams contributed to these fans, and this hypothesis needs to be tested by searching for possible terrestrial imprints. Given the large sediment volumes in these fans the possibility exists that the feeding ice-streams were responsible for Heinrich-style events, and that erosion beneath the source areas significantly controlled landscape evolution in parts of Scotland. Although it is becoming clear that several generations of ice-flow lineations exist and demonstrably cross-cut each other (e.g. Rose & Letzer, 1977; Mitchell, 1994; Salt, 2001; Smith, 2002; Clark & Meehan, 2001), reconstructions of BIIS palaeo-ice flow dynamics are in their infancy compared with other regions (e.g. Dyke & Morris, 1988; Dyke et al., 1992; Boulton & Clark, 1990b; Boulton et al., 2001; Kleman et al., 1997). We suggest that a systematic subglacial lineation mapping programme, utilizing satellite images and DEMs, is required for Britain and Ireland in order to assess the dynamics of the ice sheet through the last glacial cycle. Based on existing published information on palaeo-ice flow on the 'Glacial Map' (Clark et al., 2004), it appears that ice-divide shifts and competing ice domes were characteristics of the BIIS. The occurrence of ice-flow patterns that were both independent of (i.e. thick ice) and constrained by topography (i.e. thin ice) suggests that the bedform information records changes in ice-sheet configuration during progressive deglacial thinning. The breakup of 'marine sectors' of the ice sheet might have promoted dramatic ice-stream initiation, driving ice divides further inland, thinning the overall surface profile and changing flow configurations. It is only by a more complete mapping and assessment of flow patterns that we can address these speculations. Dahl et al., 1996) appear to be confirming the existence of full-glacial unglaciated enclaves. Continued identification and mapping of trimlines, and an ice-sheet-wide synthesis of their distribution is likely to provide information with regard to ice-sheet thickness and surface slopes. This is important as it provides independent data to that more usually collected and can act as tests of palaeoglaciological reconstructions by inversion of geomor-phological data or by numerical ice-sheet modelling. There is a long and controversial history of research on ice-dammed lakes. From a palaeoglaciological perspective such lakes are important as they constrain ice-margin positions and recession patterns. Most research has been conducted on individual ice-dammed lakes rather than syntheses aimed at constraining ice-margin retreat patterns. A preliminary effort has been made to record the most prominent lakes on the 'Glacial Map of Britain' (Clark et al., 2004), but this requires more systematic work to better establish the number and validity of lakes. An alternative line of investigation would be to conduct GIS analysis using a high-resolution DEM, across which the ice margin is backstepped to successively predict where ice-dammed lakes should have occurred and compare this with the geological record. Such an approach has been used for part of the Laurentide Ice Sheet, in which predicted lakes were found to display a good match with the geological record. This approach predicted further lake positions, and importantly was able to verify published accounts of the general ice-margin retreat pattern (Stokes & Clark, 2004). based thermal regime (i.e. drumlins and eskers), and yet for Britain these are much more sparse (<20%?). In part this certainly arises from incomplete mapping as highlighted earlier, and may also partly be a consequence of upland terrain with a thin sediment cover. However, we suspect that a major cause for this overall difference is that large parts of the ice sheet over Britain were cold-based, and if recognized and established it may help explain the distribution of landforms and guide reconstructions of ice dynamics. 1 Deriving a palaeoglaciology of the BIIS is important for wider earth system science objectives of understanding the climate system, ice-ocean interactions and how ice sheets operate. 2 There is a wealth of published information collected over 150yr that remains considerably underutilized at present. This is especially so for landform evidence. 3 A weakness in existing literature is our limited accomplishment at assembling the palaeo-ice sheet jigsaw puzzle. This is now being addressed, such as the recent synthesis on dating constraints (Bowen et al., 2002), assessment of spatial icesheet limits (Ehlers & Gibbard, 2004), elevational limits (Ballantyne et al., 1998a,b) and the compilation oflandform evidence in the BRITICE GIS and 'Glacial Map' (Clark et al., 2004; Evans et al., 2005). 4 High-resolution satellite images and DEMs are set to revolutionize our approach to the mapping of glacial geomorphol-ogy, and in the coming years may permit elucidation of major ice streams and configuration changes as the ice sheet evolved. Indeed, once sub-5 m grid-sized DEMs become available (and at a cost appropriate to academic research!) it will be possible to complete the mapping of glacial geomorphology of Britain and Ireland in a decade. • Which elements of the observational record are robust? • Are the models compatible with these? • Which model best explains the data? • Where and why do mismatches occur? • What is missing from the modelling? In the progress of knowledge it is understandable to start at a simple level and gradually build in the complexity. When it was once thought that ice sheets were sluggish to change and we had not fully recognized their sensitivity to climatic and oceano-graphic variability, focus was on establishing the maximum limits of the ice sheet and elucidating generalized flow patterns and ice sources. It was safe to presume simple symmetric growth to the LGM state and retreat from it, albeit with some readvances. We now know that the BIIS must have been considerably more dynamic, especially given its proximity to the thermohaline conveyor of the North Atlantic. Growth and decay was probably asymmetric, sourced in one area and possibly retreating back to another. Marine sectors may have catastrophically broken-up and discharged Heinrich-style iceberg calving events, ice streams turned on and off, and ice divides migrated. The challenge is to derive new information and make much better use of existing evidence to better constrain some of these dynamics.